Pixies performing at Enterprise Center in Saint Louis Sunday. Photo by Sean Derrick/Thyrd Eye Photography. 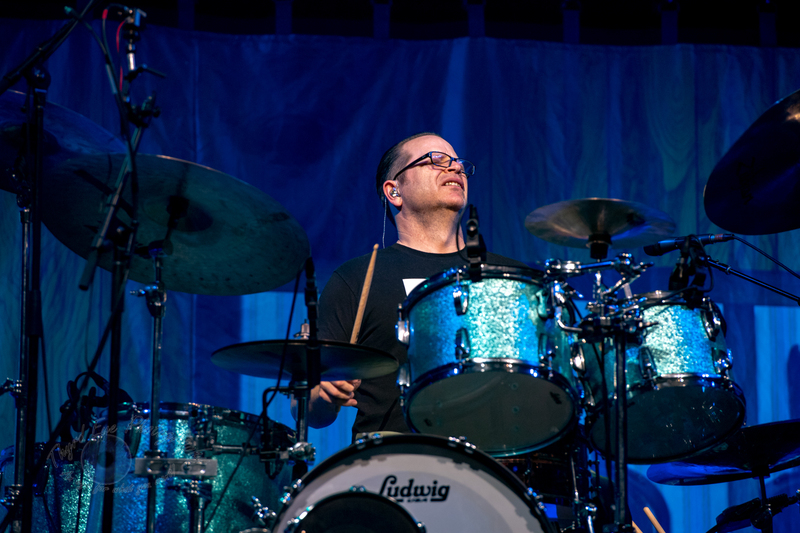 Weezer and Pixies brought their co-headlining tour at the Enterprise Center in St. Louis, MO on Sunday. Fans were excited for this tour and even a very stormy night with large hail in the forecast didn’t stop them fans from filling the arena seats. 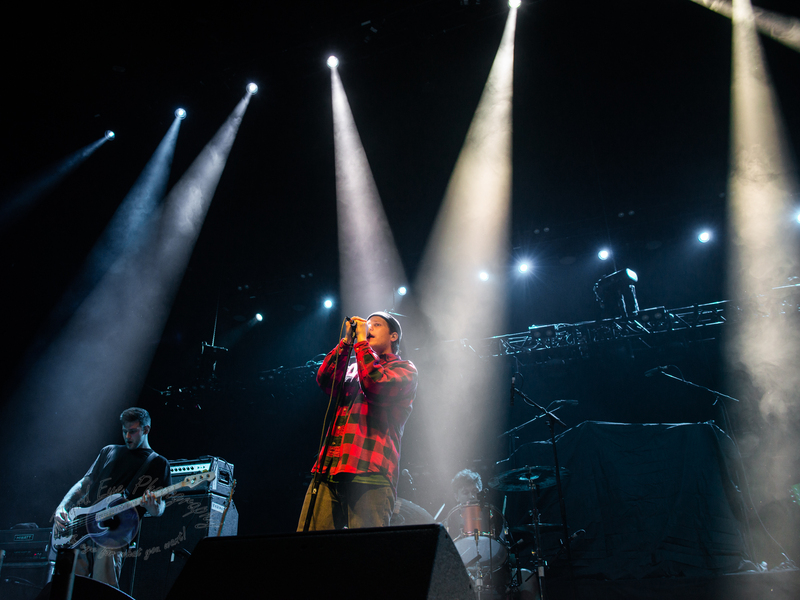 The show started promptly at 7:00pm with an English band named Basement. I had never really heard of them before, but I’m always open to new music, especially of the rock/punk variety. If I had to describe their sound, it reminds me of a band named Finch. 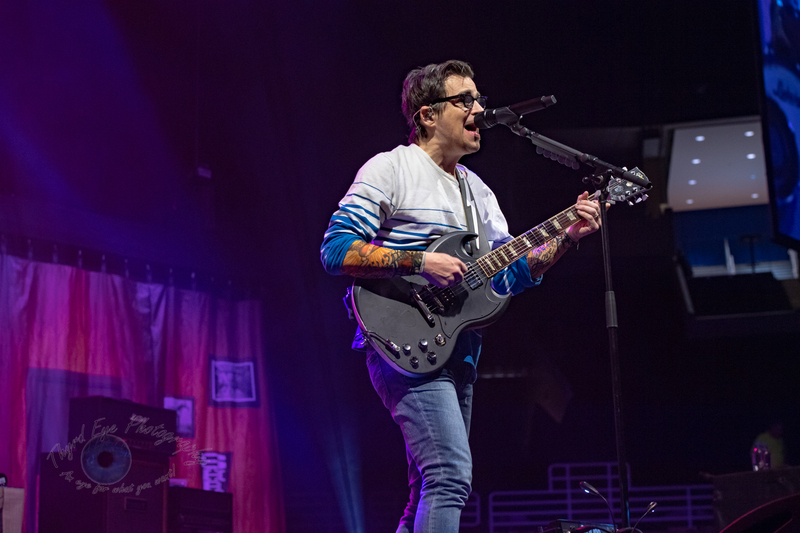 Basement opened for Weezer and performed at Enterprise Center in Saint Louis Sunday. Photo by Sean Derrick/Thyrd Eye Photography. Lead singer Andrew Fisher awkwardly danced around the stage as well as with his microphone stand, but you could tell he was having a great time. The seats were only about half way filled at this time and no one seemed to be standing to watch them, though this is usually expected for an opening band. Before playing their last song called “Promise Everything” Fisher made the comment “Hope the seats are comfy, and be careful on the stairs.” This song was my favorite that they had played, and it showed his great vocal range. 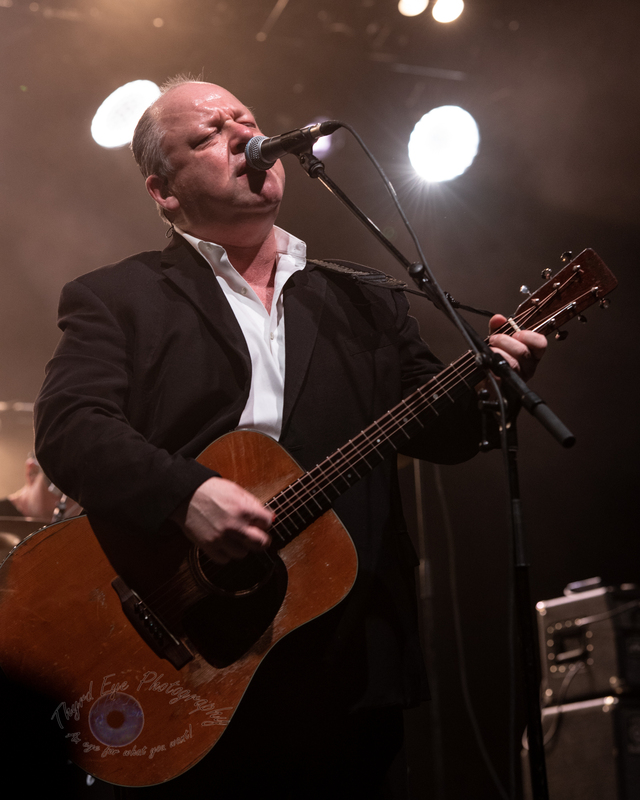 Next on stage at 7:45pm were Pixies. I had heard a few songs from them in the past, but didn’t really follow them too much. It’s not the type of music I usually listen to. The first song they performed was “Cactus”, which I really enjoyed. About half the arena was out of their seats singing and dancing. You could tell a good portion of the crowd was there to see them. My favorite part of their set was later on between songs. 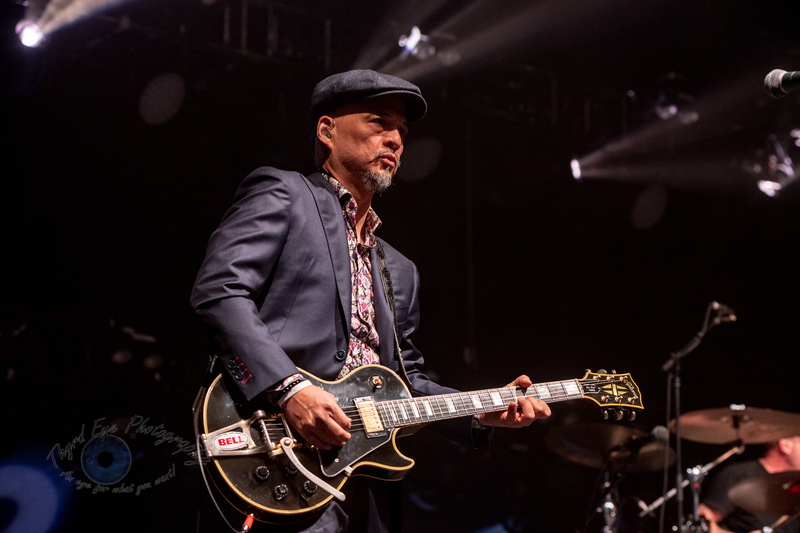 Lead guitarist Joey Santiago took off his hat and started to play the guitar with it. The crowd went WILD and started to chant his name. He then unplugged his guitar and started to play with the end of the cord to make it sound like a guitar, which I had never seen before. I applaud him for his creativity. I also really enjoyed the lighting they had for their performance. It was bright, trippy, and fit their music perfectly. As the set went on, Pixies didn’t seem to interact with the crowd at all, and only took breaks of a few seconds between songs. My thought was they were trying to fit in as many songs during their time slot as possible. But after playing their last song (which the crowd had no idea was their last), the band members put their instruments down, bowed, then walked off stage without saying a word. Without so much as a thank you to the crowd, I found that to be a little bit distasteful. While waiting for the stage to be set up for Weezer, the crew put up black curtains all around the stage so the audience couldn’t see what they were setting up. Of course, this really got everyone excited. 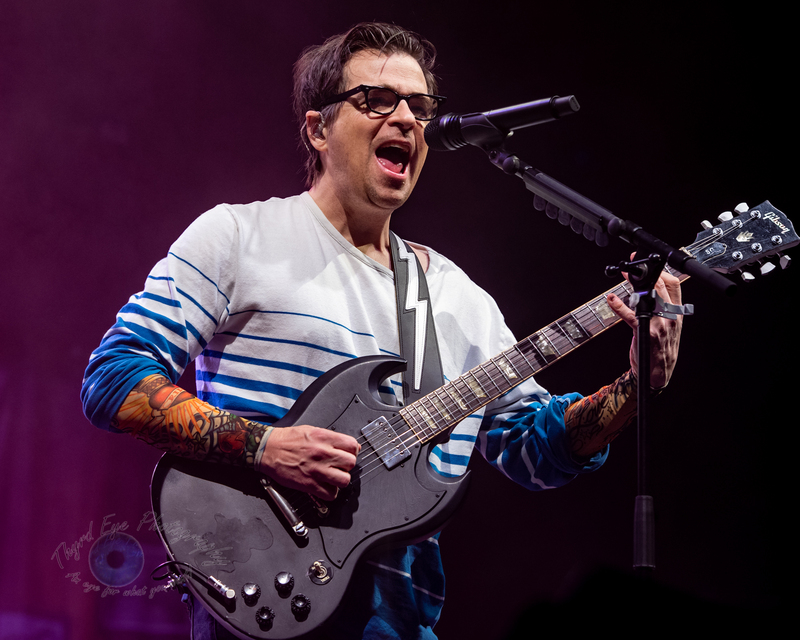 Weezer performing at Enterprise Center in Saint Louis Sunday. Photo by Sean Derrick/Thyrd Eye Photography. 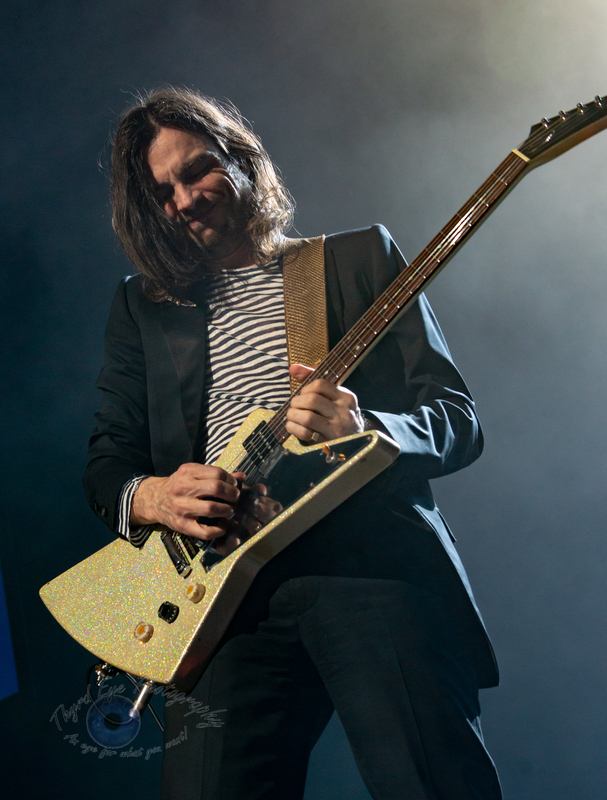 At 9:25pm, with a completely packed and standing crowd on the lower bowl and the floor, the four members of Weezer walked out in front of the stage (with the curtains still up) dressed as a Barbershop Quartet, which really got the crowd cheering. They started singing “Buddy Holly”, which I absolutely LOVED and thought they put together perfectly. Once Weezer was finished singing, they walked backstage and the “Happy Days” theme song started playing. The curtains dropped, and they ran on stage. The stage was basic, but interesting at the same time. It reminded me of an old high school cafeteria. They had three stage changes throughout the entire show, which really added to the mood of their songs. Weezer played one of their “new” songs called “Can’t Knock the Hustle” from the Black Album, and then brought a disco ball to the stage. This was one of my favorite additions to the stage, because it lit up the whole stadium with lights and was a pretty sight. As a complete opposite from Pixies Weezer interacted well with the crowd throughout the entire show. The stage included three podiums that went out towards the crowd where the band members could stand on and play. They also tried to make it a point to come to ALL sides of the stage and interact with the crowd up front. 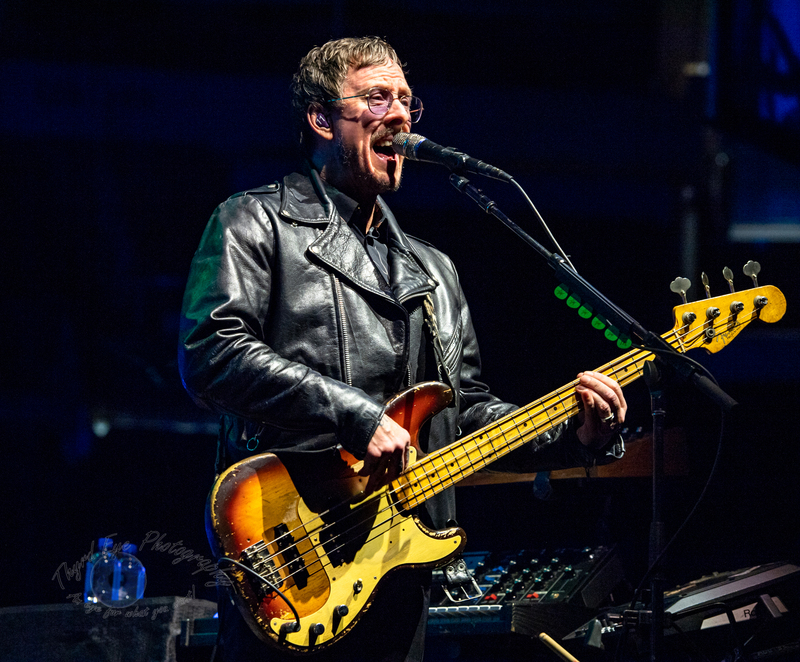 The bassist, Scott Shriner, threw out guitar picks to the fans a few times during the show and at one point strapped on a t-shirt gun firing t-shirts to the crowd. Weezer played a lot of cover songs from the Teal album. 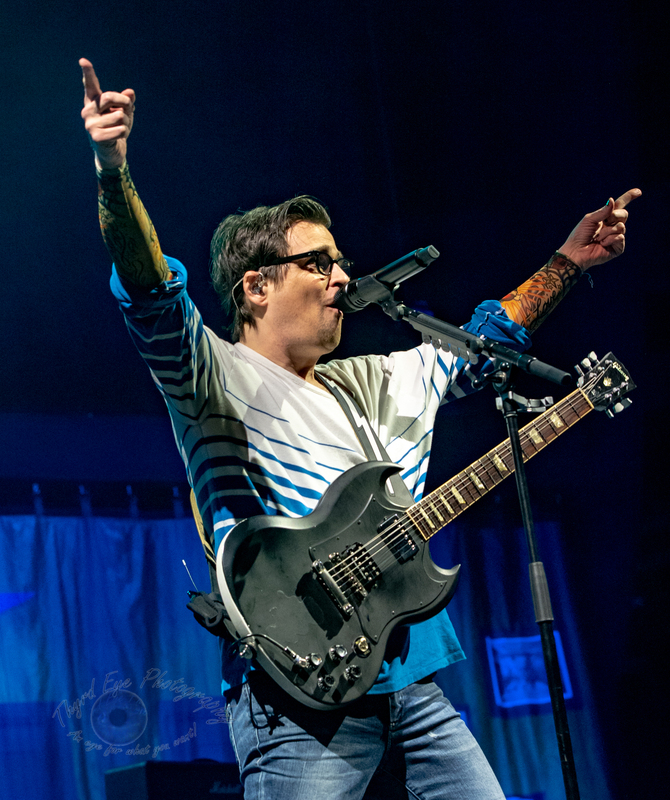 My favorite part of the show was during their cover of “Paranoid”, the lead singer, Rivers Cuomo, jumped into a wooden boat next to the stage, aptly named “S.S. Weezer”. It had a white flag hanging off the back with the Weezer “W” in black on it. The boat started to move around the stadium floor while he was playing guitar. It stopped at the back of the stadium and Cuomo played a few songs for the fans in the back. While singing “Perfect Situation” in the boat, the crowd got out their cell phones and had their lights on, which created a cool effect. Cuomo stopped and comically said “Yeah, turn on the lights, make me feel like a rock star” and then continued playing again while the crowd sang along. Once he started “sailing” back to the stage, he brought out a row and started to play it like a guitar. Weezer did a really good job at keeping the crowd entertained. Before playing “Pork and Beans”, an old school TV stand (like one you would see during grade school movie days) came out on the stage. The band started playing the song and the music video to “Pork and Beans” started playing on the TV screen. Other highlights included lead guitarist, Brian Bell using a Talk Box, and fireworks and fireballs shot out on stage during a few of their songs (which I could feel the heat from in my seat (not sure how the drummer, Patrick Wilson, felt during that, haha! ), and overall just having a great time on stage. 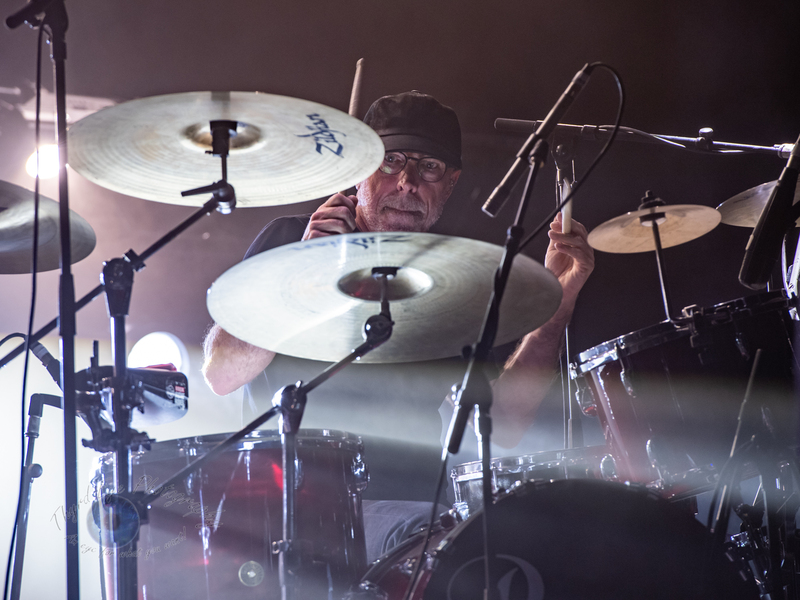 If the band members are having a great time, then the crowd usually stays energized. Sunday night the crowd for Weezer was DEFINITELY energized. They ended the night with two encore songs. The first song was the cover of “No Scrubs” by TLC (probably one of my favorite covers by them) and it seemed the whole crowd loved it and sang along loudly. The last was a full electric version of their hit “Buddy Holly”, which I think is just about everyone’s favorite. 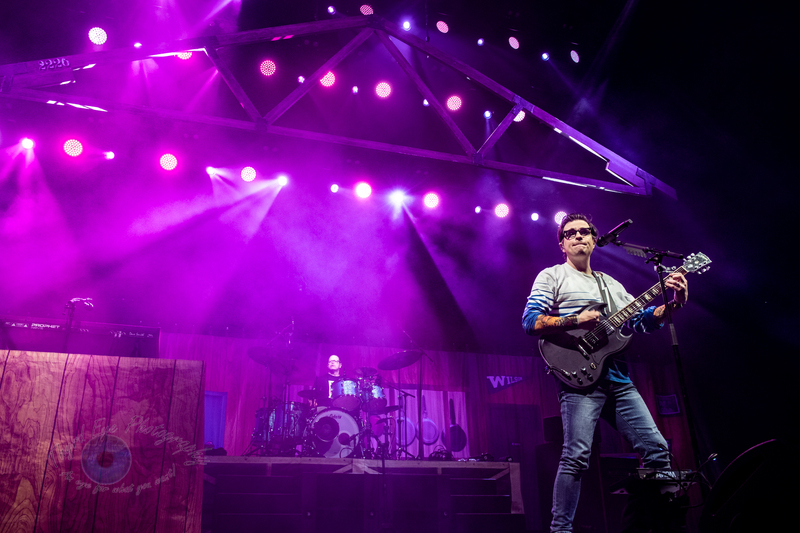 Overall, Weezer really put on an entertaining show. They kept the crowd energized, and played everyone’s favorite songs. It was probably one of the best shows I had been to in a long time. If I had the chance to see them again, I definitely would. 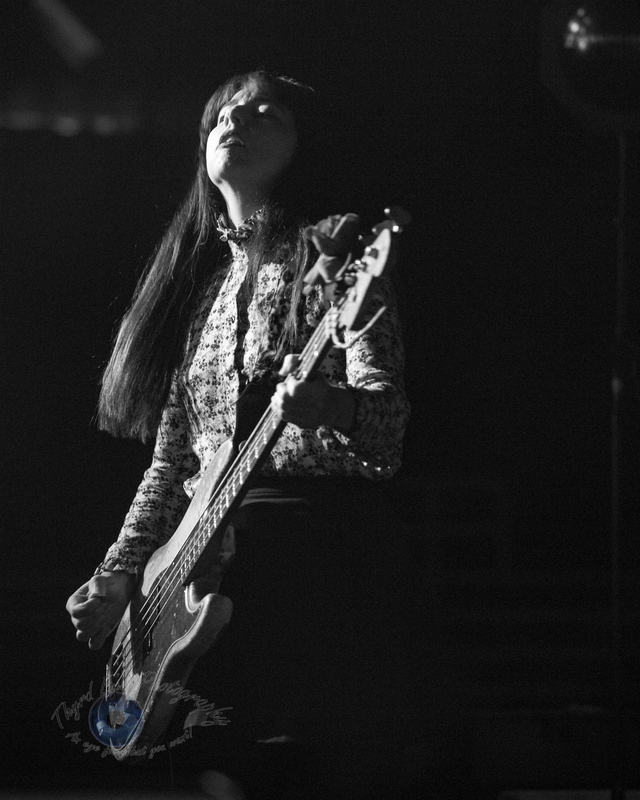 Be sure to check out the photos from the show after the set list.